A 21-year-old woman was admitted to the hospital with acute abdominal distension and pain for the last 24 hours. Although she had been having intermittent vomiting, constipation and sub-acute abdominal pain for the last two years, there was an acute exacerbation of symptoms with episodes of acute abdominal pain, distension and vomiting for last seven days. The patient had been on medical treatment for intermittent abdominal distension, pain and vomiting by local physicians but there was no history of hospital admission. She denied any bowel movements for the last five days. Physical examination on admission revealed marked abdominal distension. There was marked tenderness to palpation and decreased bowel sounds. Patient had tachycardia and increased blood pressure at time of examination. The remaining physical examination and laboratory data were normal. 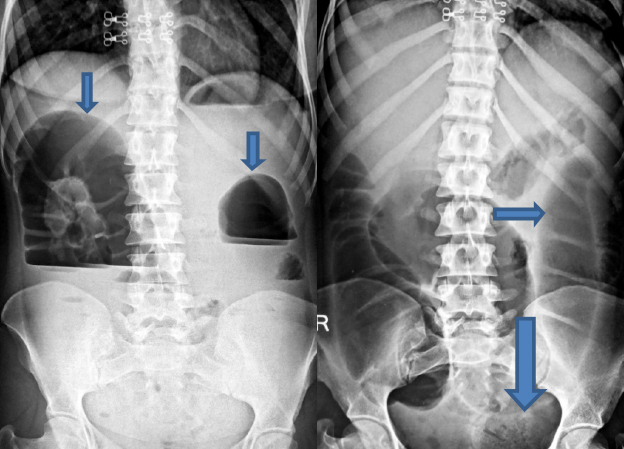 Abdominal radiographs (erect and supine, Figures 1A and B) revealed large bowel dilatation with large mixed density lesion with interspersed air foci within, giving mottled appearance at the distal end of the dilated left gas-filled colonic shadow. No free intraperitoneal air was seen. Then, upon physician request as per protocol, emergency abdominal ultrasonography was done. 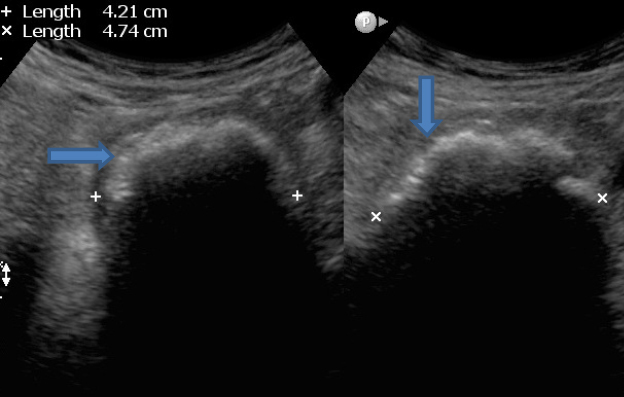 On ultrasonography, a well-defined lobulated hyper-echoic lesion with strong posterior dirty shadowing was seen impacted at proximal sigmoid colon with significant dilatation of proximal large colon extending up to caecum (Figures 2A and B). No significant increased peristalses were seen. Small-bowel loops were collapsed. On the basis of X-rays and ultrasonographic findings, we gave possibilities of colonic bezoar/faecolith; however, bezoar was the first possibility given, as the density of the lesion was less than calcification on plain radiograph, and the posterior acoustic shadow on ultrasonography was somewhat dirty (like that of air). Considering patient’s acute condition and radiological diagnosis, patient was operated on. Per operation, large bowel dilatation was discovered with transition at sigmoid level and when it was opened by longitudinal incision, a large lobulated ball of cloth fibers interspersed with faecal matter (Figures 3A and B) was seen impacted at proximal sigmoid colon, which was removed operatively and the colonic incision was closed transversely. Post-operative period was uneventful. And when elicited, there was a history of the patient eating cloth fibers for the previous three years, for which psychiatric evaluation was advised. Psychiatric evaluation found the patient to be mentally disturbed for the past few years due to marital disharmony. She has been undergoing treatment for psychiatric illness along with routine follow-up in the surgical outpatient department. Cloth fiber bezoar, causing left colonic obstruction. Differential diagnosis: faecolith, calcified mass. The word bezoar is derived from the Persian word “padzahr,” which means antidote. The bezoars are concretions or masses of foreign material seen in different locations of gastrointestinal tract.1,2,3,4 They are classified into different types: Phytobezoar, Trichobezoar, Lactobezoar, and Hard concretions. The phytobezoars are composed of fibrous matter, such as skin, seeds, vegetable, and fruit fibers. The trichobezoars, or hairballs, are composed of masses of hair and decaying food materials. The lactobezoar contains undigested milk curds and the hard concretions are inorganic masses or calculi usually containing calcium. Recently, many iatrogenic gastrointestinal lesions, including bezoars secondary to medications (Pharmacobezoar) have been reported.5-7 Although bezoar formation may occur in individuals with normal gastrointestinal anatomy and physiology, patients with altered gastrointestinal anatomy and/or motility are at increased risk for developing bezoars. Bezoar formation has also been described in patients with coexistent illnesses affecting gastrointestinal motility, such as diabetes mellitus, Guillain-Barre syndrome, myotonic dystrophy, and hypothyroidism.8 Other medical conditions associated with increased risk for bezoar development include cystic fibrosis, intrahepatic cholestasis, and renal failure. In addition, patients with psychiatric illnesses are at an increased risk for bezoar formation.9 Most bezoars are formed in the stomach, and may cause intestinal or esophageal obstruction after breakup and migration of the gastric masses. Primary colonic bezoars are extremely rare. Review of literature revealed only two reports of primary colonic bezoar causing large bowel obstruction.10,11 Conventional abdominal radiographs are usually enough to detect bowel obstruction; however, its causation due to bezoar is difficult to diagnose on plain radiographs alone. The bezoars could be identified in only 10% of patients from radiographs alone, as reported by Verstanding et al.12 The bezoar on plain radiographs is seen as ill-defined heterogeneous mix radiodensity lesion with interspersed air foci within giving mottled appearance usually seen at the transition point of dilated bowel loops. They can be easily mistaken for an abscess or the presence of faeces in the colon. On barium studies, bezoar produces a heterogeneous intraluminal filling defect with interstices filled with barium. Sonography is routinely used to examine both patients with nonspecific acute abdominal pain and those with signs of bowel obstruction on radiographs. 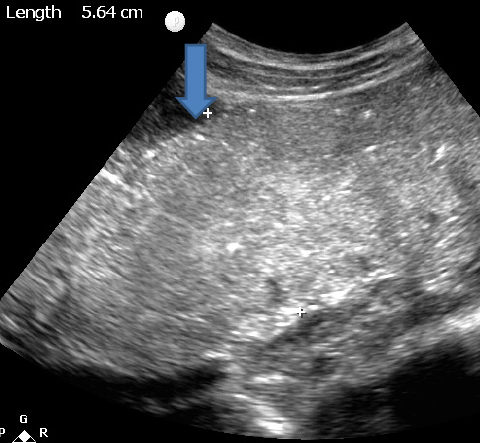 Many authors have shown ultrasonography to be of excellent sensitivity and specificity in diagnosing intestinal obstruction.13 As per literature, sonographic visualization of an intraluminal mass with a hyperechoic arc-like surface and a marked acoustic shadow is suggestive of a bezoar.14,15 On the basis of this characteristic image, we also suspected the presence of a bezoar before surgery in our case, which was proved preoperatively. Differentials include heterogeneous intraluminal masses causing intestinal obstruction. Bezoar-induced obstruction should be distinguished from gallstone ileus because bezoars produce the same sonographic image as ectopic lithiasis.16 Faecal material in the colon can also simulate the image of a bezoar, particularly in the presence of concretions. Many studies have shown diagnostic accuracy of CT in evaluating bowel obstruction in terms of cause, level, and degree of intestinal obstruction.17, 18 Oral contrast medium is unnecessary in most of the cases as in the presence of high-degree obstruction, the bowel loops are usually filled with fluid and air, which provide excellent contrast. As per literature in most of the cases, the appearance of bowel obstructing bezoars on scans is quite characteristic for diagnosis.19–22 As per published characteristic images in the literature, they usually reveal a well-defined oval intraluminal mass with air bubbles retained within the interstices and proximal dilated bowel loops. The existence of a bezoar as the underlying cause of intestinal obstruction should always be considered in differentials of intraluminal bowel masses causing intestinal obstruction. In contrast to clinical examination, radiological modalities always help physicians rapidly diagnose bezoar-induced intestinal obstruction and prevent complication. However, plain radiography and sonographic images of bezoar can be confused with other conditions; the image of a gastrointestinal bezoar—an intraluminal mass showing mottled air pattern—is quite characteristic. Ripollés T, García-aguayo J, Martínez MJ et-al. Gastrointestinal bezoars: Sonographic and characteristics. AJR Am J Roentgenol. 2001;177(1):65-69. DeBakey M. Ochsner A. Bezoars and concretions: Comprehensive review of literature with analysis of 303 collected cases and presentation of 8 additional cases. Surgery. 1938;4:934-963. Rogers LF, Davis EK. Harle TS. Phytobezoar formation and food Boli following gastric surgery. AJR. 1973;119:280-290. Goldstein HM. Cohen LE. Hagen RO. et al. Gastric bezoars: A frequent complication in the postoperative ulcer patient. Radiology. 1973;107:342-344. Ferrucci JT, Eaton AB. Complications of drug therapy. In Margulis AR, Burhenne HJ, (eds): Alimentary Tract Roentgenology. 2nd ed. St Louis: Mosby; 1973:281-293. O’Maliey JM, Ferrucci JT Jr., Goixlgame JT Jr., Medication bezoar: Intestinal obstruction by an isocal bezoar. Gastrointest Radiol. 1981;6:141-144. Case TC. Acute intestinal obstruction from trichoezoar in the sigmoid colon: Case report. J Am Geriatr Soc. 1974;22:284-285. Pfau P, Ginsberg G. Foreign bodies and bezoars. In Feldman: Sleisenger and Fordtran’s Gastrointestinal and Liver Diseases. 7th ed. 2002;395-397. De Backer A, Van Nooten V, Vandenplas Y. Huge gastric trichobezoar in a 10-year-old girl: Case report with emphasis on endoscopy in diagnosis and therapy. J Pediatr Gastroenterol Nutr. 1999;28:513-515. Cohen Ml, Winsiow PR, Boley SJ. Intestinal obstruction associated with cholestyramine therapy. N Eng J Med. I969;28:1285-1286. Verstanding AG, Klin B, Bloom RA, Hadas I, Libson E. Small bowel phytobezoars: Detection with radiography. Radiology. 1989;172:705–707. Ko YT, Lim JH, Lee DH, Lee HW, Lim JW. Small bowel obstruction: Sonographic evaluation. Radiology. 1993;188:649-653. Ko YT, Lim JH, Lee DH, Ion Y. Small intestinal phytobezoars: Sonographic detection. Abdom Imaging. 1993;18:271–273. Yildirim B, Gürkaynak G, Akyol D, Temuçin G. Ultrasonographic diagnosis of small intestinal phytobezoar. J Clin Ultrasound. 1996;24:213–216. Simonovsky V. Biliary ileus: Preoperative diagnosis by US—a report of two cases. Eur Radiol. 1994;4:580–584. Maglinte DD, Reyes BL, Harmon BH, et al. Reliability and role of plain film radiography and in the diagnosis of small-bowel obstruction. AJR. 1996;167:1451–1455. Frager DH, Baer JW. Role of in evaluating patients with small-bowel obstruction. Semin Ultrasound MR. 1995;16:127–140. Quiroga S, Alvarez-Castells A, Sebastiá MC, Pallisa E, Barluenga E. Small bowel obstruction secondary to bezoar: diagnosis. Abdom Imaging. 1997;22:315–317. Ko SF, Lee TY, Ng SH. Small bowel obstruction due to phytobezoar: diagnosis. Abdom Imaging. 1997;22:471-473. García-Aguayo J, Gil P, Pérez-Clavijo JM. Ferreres Fitobezoares intestinales: imagen característica en la TC. Radiología. 1997;39:726–728. Gayer G, Jonas T, Apter S, et al. Bezoars in the stomach and small bowel- appearance. Clin Radiol. 1999;54:228-232. Gathwal CK, Gathwal MB, Singh K, Arya A. Radiological Case: A rare case of left colonic obstruction—cloth fiber bezoar. Appl Radiol. 2015;44(12):20-23. Prepared by Dr. Chiranjeev Kumar Gathwal while an Assistant Professor of Radiology; Dr. Monika B Gathwal while as an Assistant Professor of Pathology; Dr. Kulvinder Singh, while an Associate Professor of Radiology; and Dr. Anubhav Arya while a Senior Resident of Surgery at BPS Government Medical College for Women, Khanpur Kalan Sonepat (Haryana), India.